In this story of time-travelling adventure Charlie Green discovers, by accident, that a vintage aeroplane he’s found in an old, abandoned hangar, has very magical properties – it can take him anywhere in history he wants to go! Inside a shed, which nature has tried to hide, at the bottom the overgrown garden of their new home, he and his brother Ben uncover an Aladdin’s cave of artefacts from bygone days. On the walls hang pictures of someone dressed in period costumes from all ages of history. One is different; it is of a man and an aeroplane – the magical aeroplane! 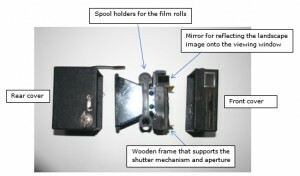 The picture has a special connection to the machine and the camera used was a Box Brownie. An Eastman Kodak Box Brownie is no more than a cardboard box, covered in faux leather, with an internal wooden frame on which to mount the shutter, lens and film spool; designed over 100years ago. 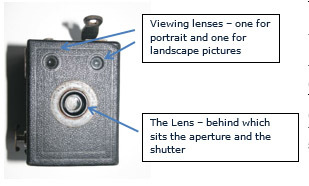 A camera works by recording an image on photographic film that is chemically reactive to light. The film only needs to be exposed to the light of an image for a very short time – normally fractions of a second. If too much light reaches the film, it just turns black and no image could be produced. Therefore a camera must prevent all unwanted light from reaching the inside – only light (from the image) is allowed through the lens via a shutter. 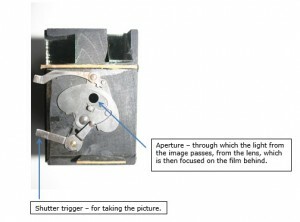 It is the shutter that controls the length of time the light is allowed to pass to the photographic film stored inside. 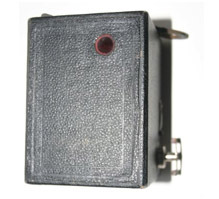 There is no other camera that is as simple in operation as the Box Brownie. Although, there are many variations of this wonderfully basic camera to which additional technical features have been incorporated – like variable aperture (the size of the hole that lets in the light), or as in this case a time delay facility. To take a picture the camera is held so that it may be viewed from above and the image required displayed in the appropriate window – either portrait or landscape. To take a portrait picture the camera is held upright and for landscape it is held on its side. On the same side of the camera are the winder that is used to move the film on to the next frame shot, the time delay lever control and the shutter trigger lever. The little catch is used to hold the two halves of the camera together. 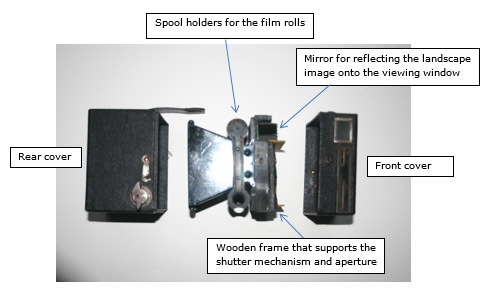 With the front and rear cases removed the wooden frame, to which the shutter mechanism is mounted at the front and the funnel shaped light box to the rear, over which the film runs, can be clearly seen. With the front cover removed the simple shutter mechanism can be seen. Here the shutter is being held open by the timing lever at the top of the mechanism. The shutter itself is thrown over by the tiny spring that can be seen attached to the shutter plate. The power of the spring combined with the size of the shutter slot gives an aperture opening of between 1/50th to 1/100th of a second. 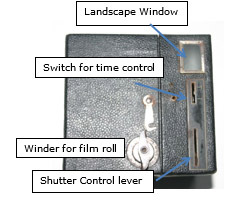 The timing lever is used to manually control the length of time the shutter is open – for long exposures. The two image reflecting mirrors can be clearly seen at the top of the wooden frame. Inside view through the funnel shaped light box of the camera, from the rear towards the aperture at the front. 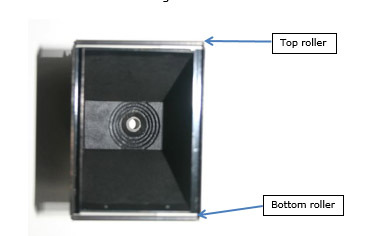 The film, held on spools near the front of the camera, would go over the top and bottom rollers and be wide enough to cover the width of the light box. The small circular red filter window is where the number on the film roll can be viewed. The film winder can be seen on the lower right of the picture.